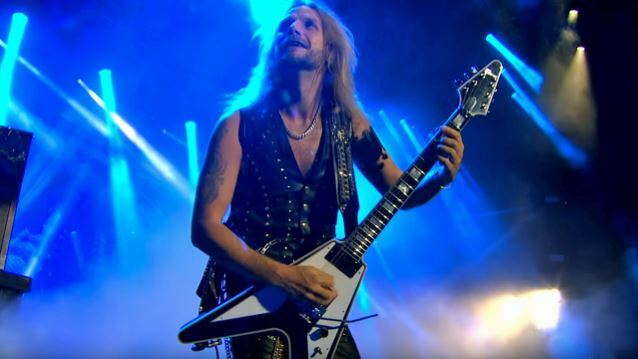 During a question-and-answer session this past September at the Rock 'N' Roll Fantasy Camp in Hollywood, California, Richie Faulkner spoke about JUDAS PRIEST's songwriting process as he and his bandmates prepare to release their new album, "Firepower". He said (see video below): "We kind of go away after a tour, and we will put down… You get an idea and you put it down in your voice-memo thing or whatever. And we'll put down ideas, riffs at home, so when it comes to the time when we're gonna get together, me, Rob [Halford, vocals] and Glenn [Tipton, guitar] will go and get the riffs out, the song ideas out. Rob might come in with a vocal melody or an idea, and I've got exactly the thing to go with that. And it's so relaxed — there's no ego; nothing like that. It's just three buddies making music to hopefully the best they can do. So it's really free and really relaxed. So, yeah, we do a lot of it on our own and then bring it together and put it all in a pot. And hopefully a great album comes out." At the same event, Halford discussed PRIEST's nearly 50-year history and his excitement about still making music after all this time. "When you're in a band, it's the best feeling in the world, because you're actually able to bring out into the world of music things that you've had internally in the creative process," he said. "So it's one thing to be able to do that, and it's just an incredible honor to have the support and love and friendship of all of our PRIEST fans around the world, who really do motivate us… And it doesn't really matter in terms of proficiency as far as how big your band is or where you go or the size of venue or whatever, it's the greatest feeling in the world to be in a band. It's just a very, very special thing to do." Due in early 2018, the follow-up to 2014's "Redeemer Of Souls", "Firepower" was recorded over a period of several months with the band's longtime collaborator Tom Allom, acclaimed British knob-twiddler Andy Sneap (MEGADETH, EXODUS, TESTAMENT, ACCEPT) and engineer Mike Exeter (BLACK SABBATH). Support on the trek will come from SAXON and BLACK STAR RIDERS.